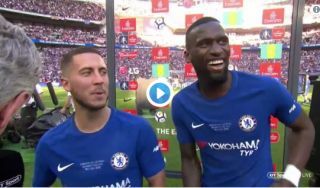 Chelsea star Eden Hazard told Antonio Rudiger he can keep him at the club if he plays like he did today every week. This tongue-in-cheek comment came after the Belgian seemed keen to dodge questions over his future following his starring role in today’s FA Cup final win over Manchester United. Hazard scored the winner from the penalty spot in the first half to decide the match at Wembley, but this has followed some speculation over his future. The Sun have recently reported on Hazard’s uncertainty over signing a new contract at Stamford Bridge, while Don Balon have claimed Real Madrid are increasingly confident of signing the 27-year-old after the Blues missed out on a top four spot. Hazard wouldn’t be drawn into discussing his future in the interview above, though he did joke that Rudiger could have a role in keeping him in west London. While this was obviously a light-hearted comment, there is an element of truth in it, with a big improvement needed from much of this squad to give Hazard the kind of success he’s become used to. Rudiger and other summer signings have been poor for Chelsea for most of this season, leading to them slumping from first to fifth in the space of a year.